16th YOUTH FILM FESTIVAL AND 4TH FOUR RIVER FILM FESTIVAL BRING BACK CINEMA TO KARLOVAC! From 7th to 10th September, the 16th Youth Film Festival and the 4th Four River Festival will become the most important place for Croatian as well as international high school film. 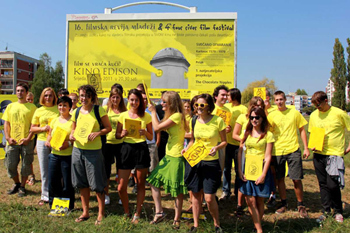 Thanks to the organization of the Croatian Film Association and the Cinema Club Karlovac, the city of Karlovac will again “become yellow” and about 150 high school kids from all over the world will get their dose of the colour yellow and good films. About two months ago, the selection jury chose 84 films from 22 countries to compete for the title of this year’s best films. That’s when this little movie madness started and, in a week’s time, it will become a complete circus – the Hollywood of Karlovac, only with a yellow carpet, instead of a red one! There will be plenty of film magic starting with the first day of the festival! In addition to the three well-known venues – City Theatre Zorin dom, Old Town Dubovac and the Youth Library – another place will become yellow this year. It is a place where the older generations went on dates, where people waited for hours in line to see a film, a place everybody even today regrets is no longer in use – Edison cinema! Edison was one of a total of five cinemas in Karlovac, but today things are slightly different. Karlovac is a town that has been without a cinema for the last five years; what is more, it is a town that has a film festival, but not a cinema. “The last role of film was screened at Edison in 2007. Accidentally or not, that was the year when the YFF, and a year later the FRFF, came to Karlovac to stay. It is telling that the paths of these two institutions of sorts should cross. Therefore, when a few weeks ago we were offered to have the festival opening, for the first time since it is held in Karlovac, in a real cinema, with a real projection screen and projector, I simply couldn’t say no. In Karlovac, a town that does not have a cinema but does have Edison, the first purpose-built cinema theatre – not only in Croatia, but in the whole Southeastern Europe – after five long years we will again hear that charming crackling sound of the film projector and the 24 frames per second will flicker before our eyes. For just one night, but still… The residents of Karlovac will at least during these few hours on 7th September 2011 again have a chance to sit at a real city cinema and enjoy a real film screening, which makes me extremely happy! And it doesn’t make only me happy but the whole festival team,” said proudly Marija Ratković, the Coordinator of the YFF and FRFF. The opening ceremony will be hosted by the acclaimed actress from Karlovac, Zrinka Cvitešić. The first screening of films in competition will be accompanied by a special treat, a unique screening of a segment of the documentary film 1579 – 1979 by the Oscar-winning author, Dušan Vukotić. The film was made to commemorate the 400th anniversary of the city of Karlovac and it will be screened from the original 35-milimetre copy, as well as the film Friday (Petak) from the 1960s, whose authors are, in a way, predecessors of today’s Cinema Club Karlovac members – the members of the Cinema group of the Dr Ivan Ribar Gymnasium of the time. The festival jury will have to decide on the films which will receive the awards, while this hard task has been bestow on two filmmakers, Romanian director Andrei Tanase and Aldo Tardozzi, a director from Croatia, as well as the Hungarian animation artist Gábor Réthi. This scriptwriting-directing-animation trio will have their hands full, just like the young trio – the high school jury. While the “big” jury will have to decide on the films to receive the nine awards, the “small” jury (consisting of filmmaker Marko Mikšić, from Karlovac, dancer and actress Tamy Zajec and last year’s Grand Prix winner, Jihye Hwang) has to choose a film that best promotes nonviolence and award it the Yellow Flag. This award, which wishes to underline the perception of violence in the films of young authors, was met with very positive feedback already last year, while this year it will be accompanied by two more events. They are a debate Does violence on film cause violence in reality? and the workshop programme consisting of five workshops: the case study on special effects using the film Show must go on, and radio broadcasting, film mask and make-up, stop-animation and one-take workshops. In addition to the debate and the workshops, the festival will have many side programmes. One of them is High School Kids for High School Kids, designed to present similar projects and festivals from around the world; this year namely from Serbia, Ireland, Norway, Hungary and Italy. Even though our “yellow” festival is dedicated to high school film, the youngest cinephiles will not be left without their own portion of great film. The screenings of the programme Film 5+ with Dukatino will be held every day at 11 o’clock at the City Theatre Zorin dom, especially for the young ones. On the first day, the kids will meet The Blue Seagull, the first Croatian film for young audiences, made in 1953, while on the next three days they will be able to enjoy the episodes of the hit series The Little Flying Bears, and the most expensive Spanish film ever made, Planet 51. For those hungry for top quality films under the stars, Thursday and Friday night are the nights when they will have a chance to enjoy the programme of Dubovac Open Air. “The Dubovac Open Air programme will showcase really excellent films. The feature debut Spots of the young academy-trained director and our own jury member, Aldo Tardozzi, links all the major festivals in the region this year – Pula, Sarajevo and Motovun. Aldo found his inspiration in the 1998 tragic event in which two high school girls first stole from their parents, then on the street of Sesvete, under the influence of pills, killed a taxi driver in order to rob him. The drama with elements of thriller brings a story about two girls’ friendship, naïveté, revenge and lost youth. The other superb film will be the recent winner of the 5th Vukovar Film Festival, Kotlovina directed by Tomislav Radić. The film is the last part of the sort of triptych comprised of What Iva Recorded on 21st October 2003 and Three Stories about Sleeplessness. Skilfully shot in a “report” style by the late Vedran Šamanović, the film won as many as six Golden Arena awards at the recently held Pula Film Festival, among which the ones for best film and best female leading role,” said Katarina Ratkaj, a member of the festival team. We are only seven days away from the beginning of the 16th Youth Film Festival and the 4th Four River Film Festival and seeing Karlovac as a town with a cinema we all so long for! Film is coming home! Join us! 16TH YOUTH FILM FESTIVAL & 4TH FOUR RIVER FILM FESTIVAL KICK OFF! The world has its money on film! HOW ABOUT YOU? COLOUR YELLOW AND NONVIOLENCE - ALWAYS IN FASHION! NATIONAL AND INTERNATIONAL FILMS UNDER WATCHFUL EYES! 84 films for this year's competition program!